If you follow me on Instagram you might have seen that I was recently selected to be a brand rep for My Boutique. This label is designed and run by Dani, who is 27 like me and also works full time in addition to designing an amazing collection of clothes. I am so stoked to be working with Dani and My Boutique for the next year and as part of our partnership I will receive some clothing each new season. Literally the day before we flew overseas I received my first pieces and I immediately put on this jumpsuit and fell in love. 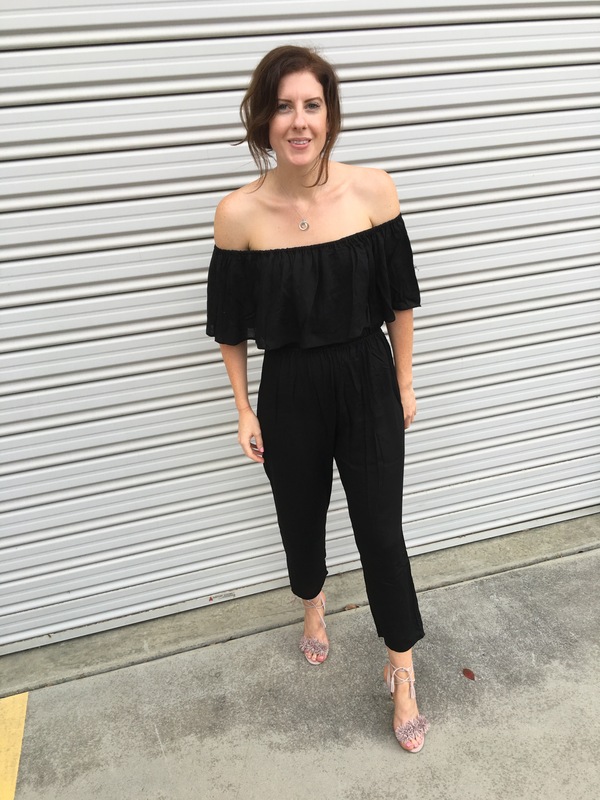 Although I love the look of jumpsuits, sometimes they are not the easiest things to wear and the proportions can be way off. Particularly those with a full length pant. This one however wears as easily as a dress. 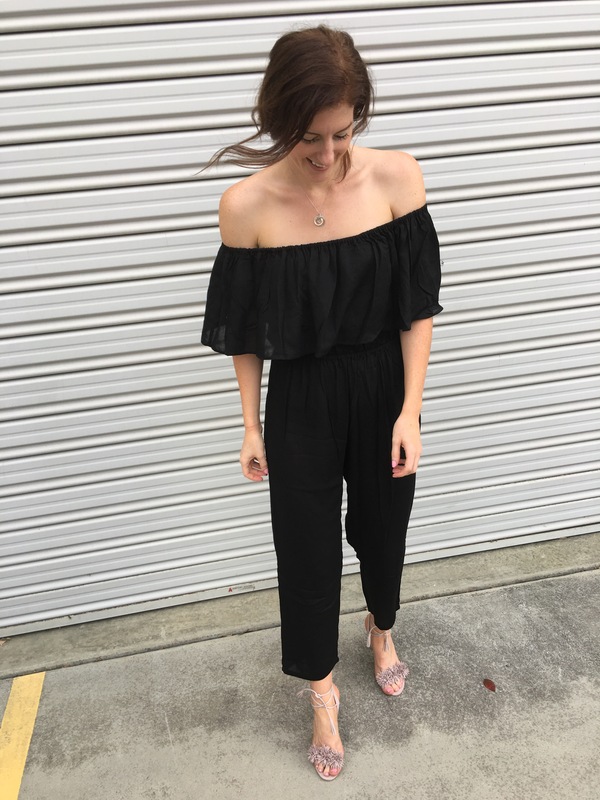 The elastic waist band and off the shoulder neckline allows you to determine where the garment sits and also means nothing digs in and the sizing is quite forgiving. I wore it out to dinner and paired it with heels but you could easily dress it down with cool sneakers and a denim jacket. I am still kicking myself I didn’t pack it for our trip. Now for the bad news, not surprisingly this piece sold out in no time but Dani is hoping to restock the item soon. So make sure you keep an eye out on the My Boutique website and if you see one of these babies, snap it up quickly! I Got This, Right? 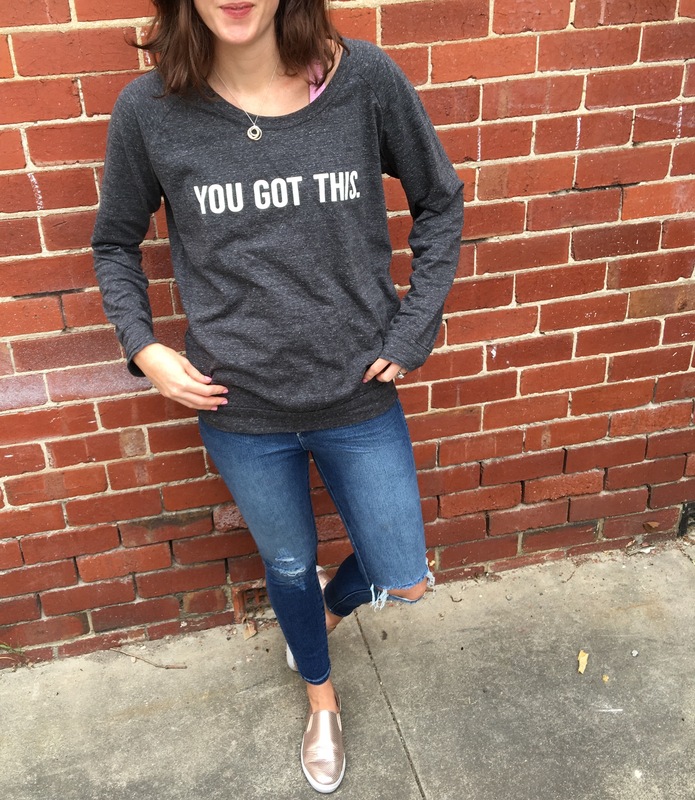 Cozy sweater / built in pep talk awesomeness thanks to Blossom and Glow Maternity. I will be wearing this on all flights, obviously! 5 Countries, 7 cities, 10 planes, 2 trains, countless taxies, 2 adults and 2 kids. Under two. Sounds fun until that last part hey? Yep, that’s right, my husband and I are about to embark on a part business – part pleasure – part family commitments, trip around the world with our two kids aged 23 months and 7 months. Are we crazy or are we brave? Are we the best parents in the world for exposing our children to different cultures and experiences or the worst for dragging them through multiple time zones and climates? Who knows but on any given day I flip flop between both and land somewhere in the middle and god knows everyone around us seems to have an opinion too.